We don’t have to tell you what’s worth it at FYF this year—you’re going to post up nice and early for Kendrick, Tame Impala, Grace Jones, and LCD Soundsystem. If you like those headliners, here are other stellar acts that fit nicely into each of their wheelhouses. 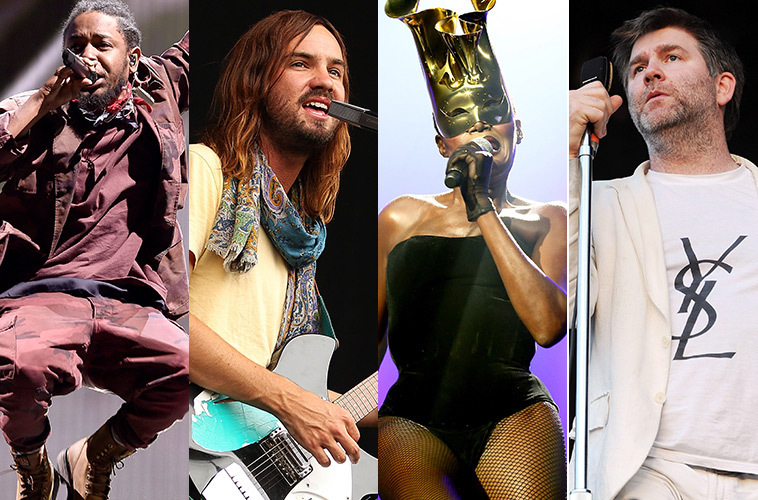 Check out our FYF playlist to brush up before the fest. …Try the trippy atmospheric creations of Beach House and Air. The mellow, psychedelic ambient rock of both bands is the perfect break from festival mayhem (not to mention real life) for the 45 blissed-out minutes they’re on stage. If the stoner-ish rock vibes of Lonerism-era Tame Impala are more your jam, don’t miss Uncle Acid & The Deadbeats or Ty Segall & The Muggers. Both are your best shot for bluesy, fuzzy, this-would-make-Dave-Grohl-head-bang psychedelia. Coming down off that trip? Mac DeMarco will help you get your weird on. Tame Impala fans will probably also dig the instrumental stylings of both Floating Points and Explosions in the Sky, who take those Tame musical breaks—like the dancey extended loop in “Let It Happen”—to the next level. …Try Banks & Steelz. They’re not an outright hip-hop act, but Wu-Tang mastermind RZA teams up with Interpol’s Paul Banks for a genre-bending trip into waters few can successfully tread. Their new record, Anything But Words, comes out the day before FYF. Happy streaming. Kendrick fans should also catch Vince Staples. He made his debut on Earl Sweatshirt’s first album, and Rolling Stone called him “The Most Exciting Man In Rap.” He also reps Long Beach, so support local. …Then don’t miss the stellar popcraft of Grimes. Her genre-jumping musical ADD never feels noncommittal or disorganized, making the Canadian artist a distinct addition to your playlists if you like artists along the lines of Twin Shadow, Purity Ring, Warpaint, or Chairlift. Peter, Bjorn & John is more than “Young Folks,” though the song’s mere mention will have it stuck in our heads for a week, and we’ll be right there at FYF whistling along with you. If you also love Vampire Weekend, Passion Pit, MGMT, Phoenix, and the like, PB&J and Hot Chip are your best bets. …See Charles Bradley. He’s the closest any of us will get to hearing Otis Redding sing, so clear your FYF schedule during his set. At 67, his expressive voice carries the aches and losses of life in a way a 22-year-old’s just can’t. His cover of Ozzy Osbourne’s “Changes” is a soulful turn beyond compare. Father John Misty isn’t a soul or R&B artist, but he has a groove all his own. His blend of honest folk rock—if you have to label it something—is full of piano flourishes, horns, strings and even electronics that complement his playful, flamboyant performance. Delivered in his rich voice, even his most cutting insights and sarcastic ballads are joy to witness.